In bread baking terms, proofing or proving means to allow the bread dough to rise. The proofing refers to the fermentation action of the yeast. In basic yeast bread recipes, the dough will be proofed two times, during which periods the bread is allowed to rise. Proofing refers to the specific rest period or amount of time that fermentation occurs. Fermentation is the necessary step in creating yeast bread and baked goods where the yeast is allowed to leaven or cause the fermentation of the dough. These fermentation rest periods are also referred to the time the dough is "allowed to rise," "bulk fermentation," "first rise," "second rise," "final proof," and "shaped proof." Rising is the most dramatic physical change a dough undergoes on account of yeast activity. Technically speaking, rising is a product of a process called respiration, which happens because of the fermentation. As the yeast eats sugars, it releases carbon dioxide in the form of tiny air bubbles in the dough. As the yeast "breathes" or respires, it causes the bread to grow and rise. The alcohol produced by the yeast during fermentation—along with a multitude of other reactions—are what give great bread its characteristic flavors and aroma. Generally speaking, more fermentation means tastier bread. The bulk fermentation, or first proof, for any dough is a crucial step in the bread baking process. It is called bulk fermentation because you are letting the dough—the entire batch—ferment as one mass, before dividing and shaping it into loaves. It is during bulk fermentation that the yeast does the majority of its work, helping your dough gain flavor as alcohol and other byproducts are produced, and gain structure as carbon dioxide inflates the bread. At a comfortable room temperature, bulk fermentation will take about one-and-a-half to two-and-a-half hours. 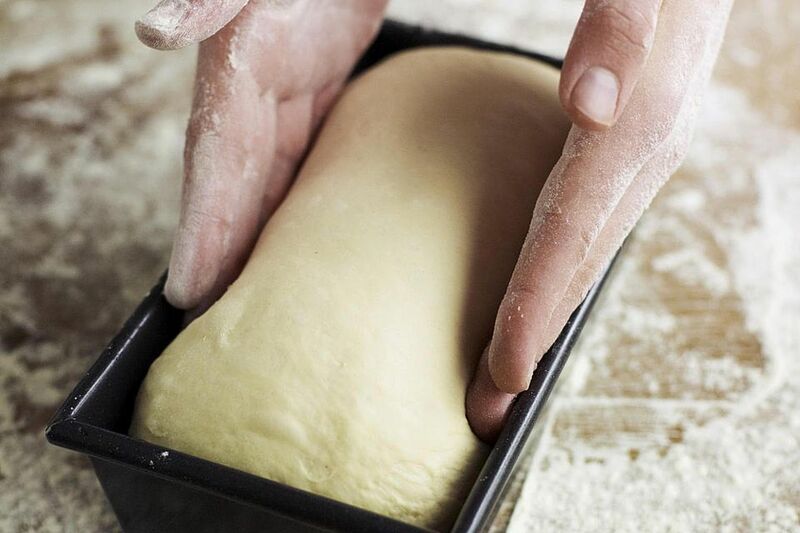 As a rule, warmer dough will rise faster than colder dough, so make sure you take stock of your prep environment. After kneading, folding, and stretching your dough, you will portion out the dough into serving sizes and loaves. You get your dough ready for its final proof by putting your dough into its final shape. You can put the final shaped dough into baskets, bowls, or bread pans, the cover with towels and place them in the refrigerator, where they will undergo their final fermentation or final proof. During this time, the loaves should nearly double in size. Proofing loaves in the fridge, which is also known as retarding, will slow down the final rise. This can give your loaves more flavor. Also, retarding loaves during their final proof can make them easier to handle and score before baking. This final step can improve the crumb, crust, and appearance of your baked loaves. Overproofing occurs when a fermenting dough has rested too long. Its bubbles have grown so large that they have popped. Dough baked at this point would result in a bread with poor structure. If you poke the dough and it springs back immediately it is underproofed and needs more time. Some breads are considered fully proofed if the indent left by the poke springs back slowly, while others are considered fully proofed when the indent remains and does not spring back. You can also use special equipment for proofing. Dough proofer or proofing box: This creates a warm environment with controlled humidity for ideal proofing conditions. Dough retarder: This is a refrigerator for the final proofing of dough. It controls the fermentation of yeast, which can help make a more sour loaf of bread. Banneton: This is a basket-like container used for final proofing. Couche: This is the cloth used to wrap or cover your final proof as it performs its final rise. What Is Carpaccio and How Is It Served?